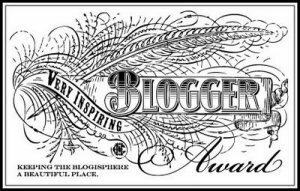 Thank you to Sandy at Another Lovely Day for nominating me for the Very Inspiring Blogger Award. I write to inspire myself and it is a blessing to inspire others through my writing. What a great way to support and honor those in our blogging community. It is also a great way to find more wonderful blogs to follow. My new car is a bike. I love to cook and live in the kitchen. I studied primate behavior in college. Yep, a great training ground for Corporate America. I started life as a dog person and got recruited to the other side. Meow. The few, the proud … born and raised in San Francisco. Love to read. My best way to relax. It is my meditation. I think Doctor Who really exists. Okay, maybe not, but it would be really cool. Here are 10 wonderful blogs that inspire me. If you have not checked them out already, please do so. Lead.Learn.Live – David is the man. The Man. The Man! I love his posts to inspire me daily. Outside Air – Kari is one of the best writers out there. Wow, read her stuff. Goal Habits – Nearly daily great quotes to make me think. Ranting of an Amateur Chef – Pat the amateur chef. I love to cook and he does too. Art of Manliness – Deep site with so much history and great writing. This site helps me maintain my man card. Another Lovely Day – Sandy nominated me and I love her writing too. She inspired me to get serious about my six impossible things. (guess what, nothing is impossible). Leadership Freak – Dan’s site is a must for anyone focused on leadership. I learn a lot from this site. About Zen – Where ever you start, do end up with some Zen in your life. Bucket List Publications – Lesley is great with one adventure after another. I dream to do half of what she does. Boyonabike – I am a bike commuter now and love the life of riding the bike. Great to read this site and go deeper into the ride. To everyone reading this post … do something today to inspire someone. We all move together.